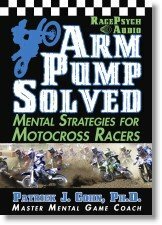 Racing psychology expert, Dr. Patrick Cohn, at racingpsychology.com helps NASCAR, Motocross, and motorcycle racers improve performance and lap times by boosting mental toughness, focus, and confidence on race day. 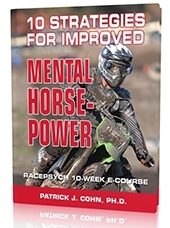 Learn the psychology of motorsport success and mental training for motocross and auto racers. In today’s racing psychology session, I help a racer who is worried about under performing. Many racers are concerned about not performing up to their potential on race day. Being new to racing, you want respect and to show others what you can do. But, you should avoid focusing on what others think of you. A functional mindset is helpful to getting psyched up before a race. Your mindset should focus on how you can perform to your potential. To prepare mentally for the big race, you should focus on the process, or the small things that you need to do to race your best. Listen to this podcast on “how to mentally prepare for a championship race” learn how to improve your motocross and auto racing training techniques! hi, i being trying to download it onto my ipod via itune podcast, but it keeps saying the link is not a valid podcast link. Go right to itunes and download the podcasts there. You will find them under racing.